Figure 5.13. Euoplocephalus, the armored, club-tailed ankylosaur. Figure 5.15. Dorsal view of the body armor of Sauropelta. back, and tail (Figures 5.13, 5.14, and 5.15). In many cases, it covered the top of the head, cheeks, and even eyelids. Under all that armor, ankylosaurs were round and very broad (see Figure 5.13); clearly their girth accommodated a large gut. 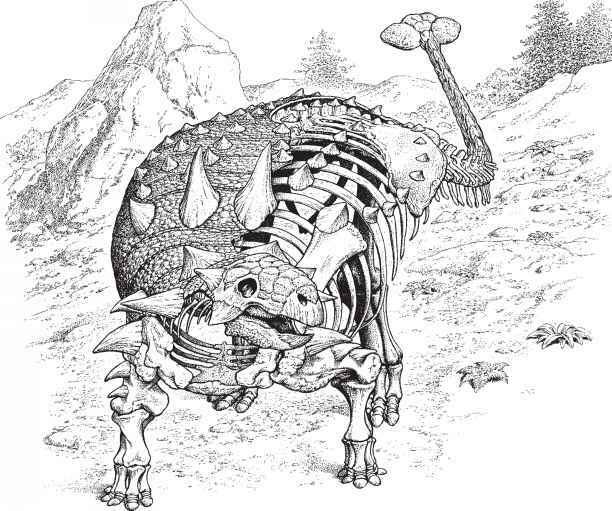 The head was low and broad (Figure 5.16), and equipped with simple, leaf-shaped teeth for pulverizing whichever plants an ankylosaur chose to eat (Figure 5.17). Ankylosaurs were mid-sized dinosaurs, rarely exceeding 5 m in length, although some (such as Ankylosaurus) ranged upward of 9 m. As in stegosaurs, the limbs were of different lengths, with the hindlimb exceeding the length of the forelimb by 150%. 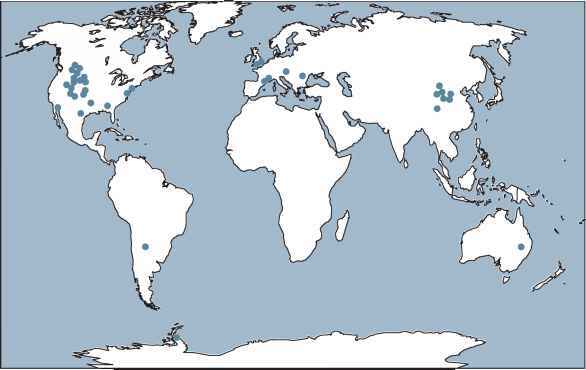 Like stegosaurs, ankylosaurs also had a global distribution, coming predominantly from North America and Asia, but also from Europe, Australia, South America, and Antarctica (Figure 5.18). As a group, they reached their peak diversity during the Cretaceous. The best-preserved fossils come from Mongolia and China, where stunning specimens have been found inland, far from the ocean (either then or now), nearly complete and articulated, and in most cases preserved upright or on their sides. In contrast, in North America, only partial skeletons have been found, and these are often upside-down, sometimes in rocks deposited along the sea shore or even in rocks representing open marine environments. The North American forms evidently lived sufficiently close to the sea that their bloated carcasses might have been carried out with the tide, flipping upside-down because of their heavily armored backs. Ankylosaur finds most commonly consist of individual skeletons or isolated partial remains; there is only one ankylosaur bonebed known. Perhaps this indicates that these animals had solitary habits or lived in very small groups. Even from our incomplete window on the past, it appears reasonably certain that ankylosaurs did not enjoy the company of huge herds. Ankylosauria consists of two great clades: Nodosauridae (nodo - knot; referring to the rounded osteoderms) and Ankylosauridae (Figure 5.19). Figure 5.16. Left lateral view of the skulls of (a) Shamosaurus, (b) Ankylosau-rus, (c) Pinacosaurus, (d) Tarchia, (e) Silvisaurus, and (f) Panoplosaurus. Figure 5.18. Global distribution of Ankylosauria. Figure 5.19. (a) An ankylosaur (Euoplocephalus) and (b) a nodosaur (Sauropelta) compared. 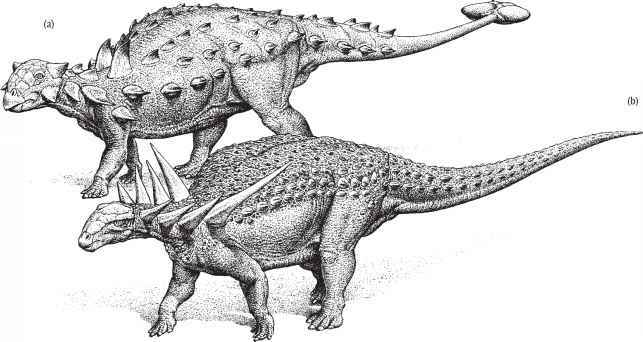 The ankylosaur is more stocky, with a broader skull and a tail club. The nodosaur is more lightly built, and bears distinctive dermal armor. Figure 5.20. Left lateral view of the skeleton of Sauropelta without its armor shield. Note the projection on the scapula (indicated by arrow), known as the acromial process. 1 m the shoulder (parascapular spines). Nodosaurids are known principally from the Northern Hemisphere (North America and Europe), although new discoveries in Australia and Antarctica have extended the geographical range of these animals deep into the Southern Hemisphere. Ankylosauridae. Members of Ankylosauridae give the impression of impregnable, mobile fortresses. 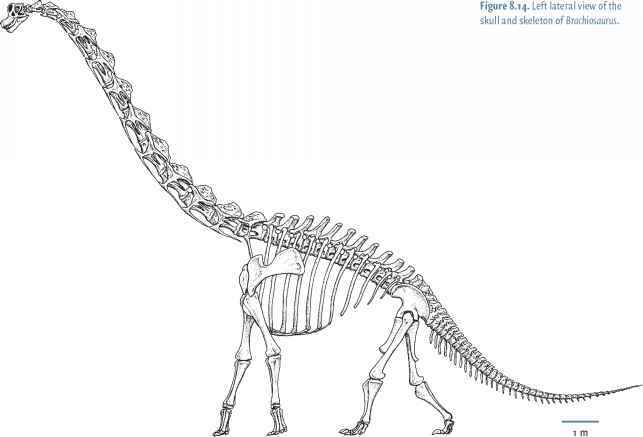 All are well armored (see Figure 5.14), but there are fewer tall spines along the body than in nodosaurids. The tail ends in a massive bony club, in some instances with several paired knobs or triangular spikes along its length. The head is shorter and broader in ankylo-saurids than in nodosaurids and there are large triangular plates attached to the rear corners of the skull (termed "squamosal horns"). Mouths to feed. Ankylosaurs doubtless had a very low browsing range, foraging for plants no more than a meter or so above the ground. The different beak shapes suggest different feeding preferences. The narrow beak of nodosaurids may suggest selective feeding, plucking or biting at particular kinds of foliage and fruits into the mouth with the sharp edge of the rhampho-theca. In contrast, the very broad beak of ankylosaurids may imply less selective feeding, in which plant parts were indiscriminately bitten off from the bush or pulled from the ground. How the food was then prepared for swallowing is a bit of a mystery. Like stegosaurs (and pachycephalosaurs; see Chapter 6), the triangular teeth of both nodosaurids and anky-losaurids are small, not particularly elaborate, and less tightly packed than animals with well-developed chewing behaviors (see Figure 5.17). However, the wear marks on the teeth indicate that grinding took place. In addition, it is likely that ankylosaurs had a long, flexible tongue (in their throats, they have large hyoid bones that support the base of the tongue) and an extensive secondary palate, which allowed them to chew and breathe at the same time. Moreover, deeply inset tooth rows suggest well-developed cheeks to keep whatever food was being chewed from falling out of the mouth. The jaw bones themselves were relatively large and strong (although lacking enlarged areas for muscle attachment). Indeed, most ankylosaur jaw features - except for tooth design and placement - suggest that ankylosaurs were reasonably adept chewers. Figure5.21. (a) The bony tail-club of Euoplocephalus. (b) Tail spikes in the tail of Pinacosaurus. dinosaurs. The stomach(s) must have served as a great fermentation vat(s), decomposing even the toughest woody plant material. Bacteria lived symbiotically within the stomach (or stomachs, because ankylosaurs may well have had a series of them). Among modern mammals, this method of breaking down tough plant material is well known in ruminants such as cows. The combination of browsing at low levels and having anatomy indicative of chewing and fermenting places limits on what kinds of plants ankylosaurs may have fed on. At the levels where ankylosaurs could forage, the undergrowth consisted of low-stature ferns, gym-nosperms such as cycads, and shrubby angiosperms (flowering plants), a rich array of plants to choose from within the first few meters above the ground (see Chapter 13). Brains. Ankylosaurs may not have been particularly adept at making such choices, however, because their brain power was close to the bottom of the dinosaur range (only sauropods had smaller brains for their size; see Chapter 8 and Box 12.4). Hand in hand with slow thinking, ankylosaurs were among the slowest moving of all dinosaurs for their body weight. Estimates suggest that they were able to run no faster than 10 km/h and walked at a considerably more leisurely pace (about 3 km/h). Ankylosaurs were built for digestion, not for speed. Defense. Although ankylosaurs were slow on their feet, other aspects of the limb skeleton suggest that they could actively defend themselves against predators. Firstly, in all ankylo-saurs the entire upper surface of the body - the head, neck, torso, and tail - was covered by a pavement of bony plates (see Figures 5.14 and 5.15). In the case of nodosaurids, the shoulder region was exceedingly powerful, with tall spines. This powerful, well-defended front end, in conjunction with relatively long hindlimbs and wide stance may have had the effect of dropping the center of gravity of the animal forward, providing nodosaurids with an aggressive frontal, spine-based defense. Ankylosaurids went even further, augmenting their armor by a powerful tail-club (Figure 5.21a), constructed of paired masses of bone set at the end of a tail (itself about half the length of the body). In some cases the tail was also equipped with spikes along its length (Figure 5.21b). How the tail-club worked requires little imagination. While the tail was flexible at its base, the rear half was stiffened by modified vertebrae, as well as by a series of tendons running down its length. These also provided firm attachment for powerful muscles. Using the flexibility of the tail vertebrae at the base and the stiffened tail, the club could have been forcefully swung side to side. For nodosaurids, a proactive defense must have been a head-first (or shoulder-first) proposition, keeping the parascapular spines pointed toward the predator. Ankylosaurids, on the other hand, likely first planted their hindlimbs and then rotated their forequarters with their strong forelimb muscles, ever keeping watch on the threatening opponent. Then they would have wielded that massive club at their opponent's legs and feet. In both ankylosaurids and nodosaurids, however, the last resort must have been to hunker down defensively. With its legs folded under its body, a 3,500 kg ankylosaur would have been formidably immobile. Safe under protective armor, both nodosaurids and ankylosaurids were the best-defended fortresses of the Mesozoic. Do you know any dinorsour called ankylosaus?